Los Angeles is the largest city in the U.S. without a football team. Will a new stadium attract a franchise and bring economic development? The Los Angeles City Council voted unanimously last fall to build a new football stadium in the heart of downtown. It was a calculated move for a city government that has been struggling with debt for years. But economists and sports-business experts warn that constructing a football stadium—especially one that doesn’t have a tenant signed up—is the economic equivalent of a Hail Mary pass. It’s a high-risk venture that frequently fails to pay off. 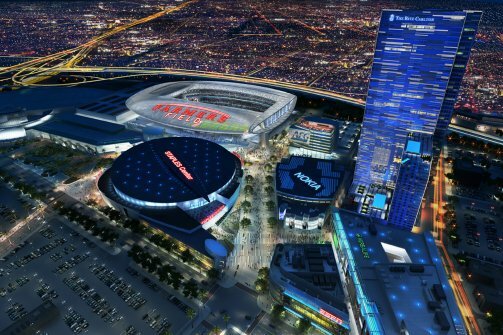 The proposed $1.5 billion, 76,000-seat capacity Farmers Field stadium envisioned for downtown L.A. next to the Staples Center is expected not only to offer a state-of-the-art entertainment venue for football lovers but also to open new employment opportunities. The City Council projects construction and operations will produce 20,000 to 30,000 jobs over a 36-month building period. The city also plans to modernize the adjacent L.A. Convention Center for $314 million in the hope that it will entice new businesses to set up shop and tourists to empty their pockets. “It creates collateral development—hotels, restaurants, or anything that would be in or around the development and growth of this particular area. So not only is it good for the area but it brings new revenue into the city and its general funds,” Perry said. The stadium will be funded entirely by AEG, the world’s largest owner of sports teams and sports events. AEG owns the Los Angeles Kings NHL team and has a stake in the Los Angeles Lakers. The corporation will pick up the check for the stadium and eventually pay back the government, which will have to issue bonds to fund the convention center’s renovations. Construction won’t begin until an NFL team signs a lease, and so far there haven’t been any takers. But the city expects to make $13.4 million annually in taxes paid once the stadium is up and running. The Los Angeles city government views Farmers Field as a gifted workhorse. But sports economists say officials shouldn’t be so fast to count their pennies. “There have been Lord knows how many studies of the benefits of teams and the benefits of new stadiums, and what it all comes down to is that they have essentially zero impact on a city’s finances,” said Mike Leeds, economics professor at Temple University. Leeds looked to Chicago as proof that sports teams are “a consumption good not an investment good.” The city has five professional sports franchises within its limits. But Leeds found that the total revenue generated from all the teams combined came out to only .5 percent of the city’s total income. Experts say sports teams rarely bring cities the economic growth that is initially expected because, although the city can collect sales taxes and charge rent on the land where the stadiums are built, the money often goes toward repaying debt that is incurred during construction. Additionally, most of the jobs are contracted and only last until the building is complete. In Los Angeles more than 16,000 of the jobs projected to come from the stadium are construction positions. Payoffs from football stadiums are often lackluster because the money the city expects to generate from tourism spending at surrounding hotels, bars, and restaurants is often overhyped. “The impact on L.A. would be even less than elsewhere because the stadium will be right next to a highway. People will drive in, spend money in the stadium, and they will drive out. There will be minimum spillover into the rest of the city,” Leeds said. Ultimately, economists say the L.A. government shouldn’t give up looking for other means of getting out of its economic slump.